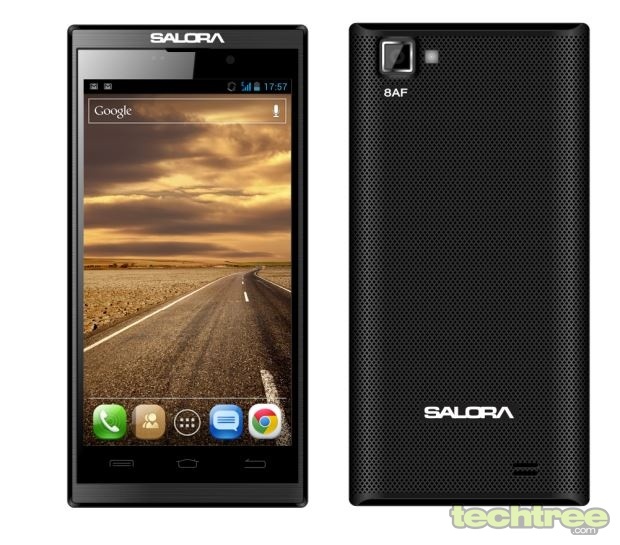 Comes with a whopping 3200 mAh battery promising 22-hour talk time; Jelly Bean-upgradeable; dual-core CPU and 8 mp camera. Finally, there seems to be a phone that attempts to solve one of the biggest issues with large screen Androids - battery life. We've always been wondering why manufacturers have not just plonked in bigger batteries, even if it means slightly more weight and cost to the customer. Not content with being just a feature phone maker, Salora has now launched a new Android smartphone known as the PowerMaxx Z1. This is indeed a big jump for the company as this handset running Android 4.0 (Ice Cream Sandwich) (upgradeable to Android 4.1 (Jelly Bean)) is being placed for the mid-range buyer, rather than taking small steps with an entry-level budget phone. It sports a 4.5" IPS LCD touchscreen with pixel dimensions of 540x960. It is powered by a dual-core 1 GHz CPU with 512 MB of RAM. An 8 mp autofocus rear camera capable of 720p recording is present in addition to a 1.3 mp front camera for video calling. Android 4.0 (Ice Cream Sandwich); Google Play. Dual-SIM (GSM+WCDMA) Dual standby; 2G GSM (900, 1800 MHz), 3G UMTS (850, 2100 MHz). 4.5" IPS LCD capacitive touchscreen with pixel dimensions of 540x960. 8 megapixel rear camera with autofocus and 720p capture, 1.3 megapixel front camera. Other camera features: Optical Image Stabilization, Panoramic Image Capture, Speed Multi-shot, Flash, Facial Beautify, Smile Shutter, Automatic Ambient Detection, Time Lapse Video. Cortex-A9 dual-core 1 GHz with 512 MB of DDR3 RAM. 4 GB internal storage; 32 GB via microSD. Wi-Fi, Wi-Fi hotspot, Bluetooth, GPRS, EDGE, GPS (with A-GPS). Micro-USB 2.0, 3.5 mm audio jack. Sensors: G-Sensor, L-Sensor, P-Sensor, Rotation Vector Sensor. 3200 mAh rechargeable battery with 22 hours talk time on 3G, 430 hours standby, 42 hours music, 10 hours video, 13 hours Wi-Fi, 11 hours 3G browsing. SAR value: At the Head - 0.556 W/Kg, At the Body - 0.766 W/Kg. 5.16" (h) x 2.54" (w) x 0.43" (10.9 mm), 170 grams. The company PR mentioned that while it comes with ICS, a Jelly Bean upgrade is possible right away, and it is up to the customer to decide what version he/she desires. The screen is also stated to feature an 'OGS' technology that makes it brighter with better power efficiency, thus increasing its legibility under the sun. It is also mentioned that it has "Zero Air Gap", which basically means that the gap between the outer screen and the inner display panel is filled with a transparent resin to improve light transmission, which should make it appear clearer. While everything looks good so far, we must mention that the phone has only 4 GB of internal storage and 512 MB of RAM, which is likely to cause less-than-satisfactory performance with ICS or Jelly Bean. Considering that this is being priced as a mid-range phone at Rs 16,000, a 1GB RAM would not have been too much to ask for, especially when there are other similar devices in a crowded market.